Ongiin khiid (also referred as Ongi Monastery ruins) is a active small monastery with a temple which was built on the ruins of a monastery complex that was formerly one of the largest monasteries in Mongolia and founded in 1760 and consisted of two separate tempes complexes, Barlim khiid and Khutagt khiid, on the North and South of the Ongi Gol river about 18 km from Saikhan-Ovoo sub-provincial center, Dungobi province. 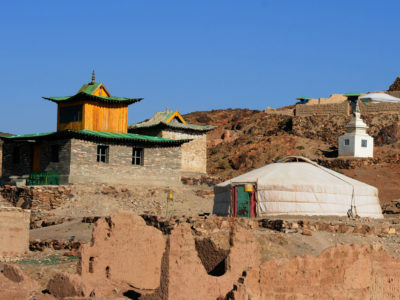 From XII to XIX century, Buddhism came at its golden period in Mongolia, with over 2000 temples, more than 700 of them monasteries, with something like 120,000 monks and nuns. 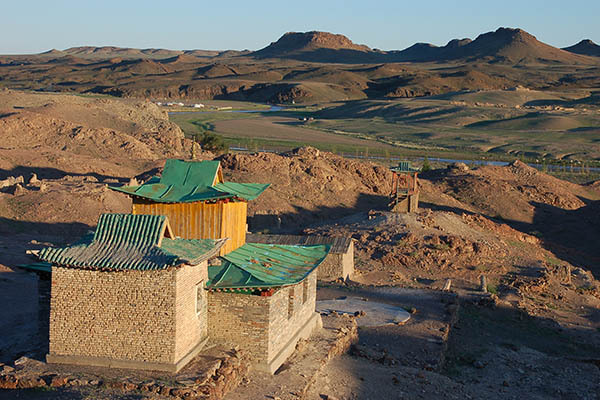 This 2 monastery complex was built to commemorate the first ever visit of Dalai Lama to Mongolia and the construction had been contunued in two phases, the south side, Khutagt Khiid, in first in 1760 and the north side, Barlim Khiid, one century later. The older southern complex consisted of various administrative buildings as well as 11 temples. The northern complex, built in the 18th century, consisted of 17 temples - among them one of the largest temples in all of Mongolia. The grounds housed also 4 Buddhist universities. 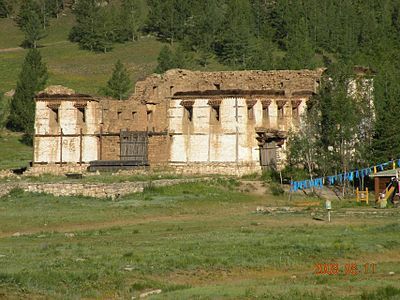 The 2 complex was destroyed in 1939 under supervisor of Khorloogiin Choibalsan, the leader of the Communist Party of Mongolia. Within a few months, nearly all of monasteries had been destroyed and about 17,000 monks killed or arrested and never seen again, with a total victims of about 27,000 persons. Raw violence of the destruction at Ongiin Khiid was still visible, still palpable, even though it happened over years ago. Over 200 monks were killed from the temples. Interesting, Khorloogiin Choibalsan was a monk in Urgoo, former name of now-days Ulaanbaatar and later became a great hero of the 1921 revolution. He became head of Government in 1928 by the support of Stallin. although Choibalsan’s regime has been heavily criticized by modern Mongolians, he is still surprisingly well regarded because of his efforts to protect Mongolia independence, in particular by resisting mounting pressure to join the USSR. In the 1990s, it was decided to rebuild the monastery. During the years a stupa and main temple were raised among the shattered foundations, they were put to use in 2004. There is a small museum in a ger in front of it. One of the stupas has just been reconstructed as well. It has a commemorative plaque indicating the names of the monks who were killed in 1939. At present (2011), 13 monks live in the monastery. The small contingent of 20 monks visit the monastery three or four times a month. There is a bright yellow ger that displays some old objects that were used its glorious period.